Soap foam is a favorite go-to sensory activity for my boys. We have tried scented soap foam and tie dye soap foam in the past and they focused solely on the sensory experience. Recently, the boys have been playing with our giant box of cookie cutters so I put them to use with this soap foam prewriting sensory activity. The result is lovely and it was a great way for the boys to work on writing the letters of the alphabet. Alphabet cookie cutters - We use the alphabet ones from this 101 cookie cutter set. To make soap foam, mix soap with a splash or two of water using a hand blender, electric mixer, or stand mixer. We like to use castile soap and we have bottles after bottles of almond scented castile soap, which is seriously the most amazing smelling soap EVER. So our soap foam also happens to be scented. Mmmm. Also, we have found that using an empty foaming soap dispenser is a great way to make soap foam. I find that using an electric mixer to make a large amount of soap foam can take awhile. However, using a foaming soap dispenser with 2 tbsp of castile soap, topped up with water, works great. Plus, the kids love to help pump the dispenser. You'll also need to dilute some liquid watercolors with water in some small cups. We like to reuse plastic applesauce cups for this purpose. We made rainbow colors because, well, life is better with rainbows. 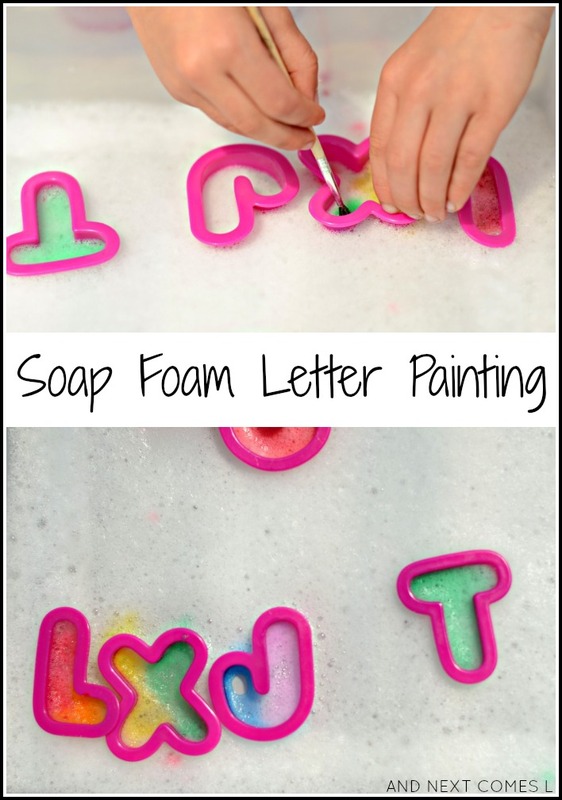 Then you just place an alphabet cookie cutter on the soap foam and paint the inside with some liquid watercolors. That's it! The painted cookie cutter letters look so pretty. I especially loved the rainbow painted W that five year old J did. When the cookie cutters are removed, you can sort of see the painted letters on the soap foam. Then when the boys were done painting letters, they dumped the remaining liquid watercolors in and used their hands to mix up some really colorful soap foam.